We’ve received a lot of questions asked about the routes, elevation details and sites of significance en route and this post has the answers! At different points in time, Bidar was ruled by the Bahmanis, the Bijapur Sultanate and the Mughals and the Bidar run routes are designed to traverse many monuments and sites that these rulers constructed. The 5K route starts out at the Bidar Fort, a 500 year old fort constructed by the Bahmani dynasty. 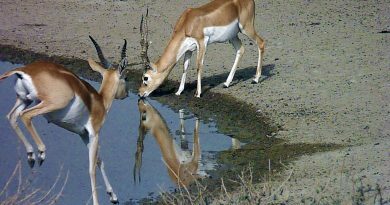 If it looks familiar in the light of the early dawn, that’s probably because you’ve seen it in recent Bollywood and South Indian movies. Read more about movies set at the Fort here. 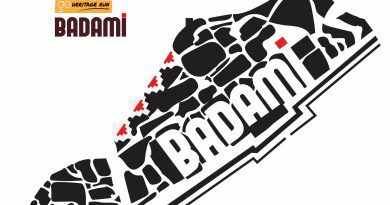 You will initially head westward – running along the outer boundary of Bidar fort. As you run along the fort wall, you’ll spot a very unique feature of the fort. It’s one of the few in the country to have a triple-channelled moat. It might be dry and in a state of disrepair today but is still quite a sight to behold so do stop to take pictures! After returning to the Fort, you will head southward – look out for the cylindrical watch-tower (Chaubara) at the crossroads. This is a majestic clock-tower so do stop and take pictures along the way! Fianlly, head northward back toward the Bidar Fort but wait… we’ve saved the best for last. As you head back to the Fort, you’ll spot the Madrasa of Mahmud Gawan – a 500 year old ancient university, and now a mosque to your left. Once you cross the finish line at the fort, don’t forget to collect your Bidri-crafted finisher medal – You will have earned it! 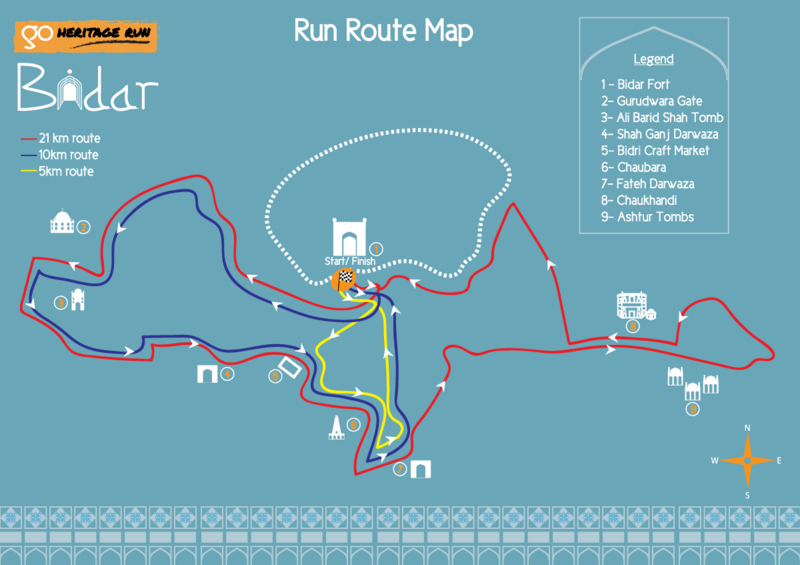 The 10K route starts out at the Bidar Fort, a 500 year old fort constructed by the Bahmani dynasty. If it looks familiar in the light of the early dawn, that’s probably because you’ve seen it in recent Bollywood and South Indian movies. Read more about movies set at the Fort here. As you run along the fort wall, you’ll spot a very unique feature of the fort. It’s one of the few in the country to have a triple-channelled moat. It might be dry and in a state of disrepair today but is still quite a sight to behold so do stop to take pictures! As you head northward, and toward the 4K mark, you’ll spot Bidar’s famous Gurudwara- the Gurudwara Nanak Jhira Sahib. Read all about here. You’ll then head westward at the Gurudwara Gate and toward the Shah Ghanj Darwaza. As you head further eastward and approach the 7K mark, you will pass the craft market famous for its Bidriware artisans. It will be closed at this early hour but fear not – your finisher medal has been made by one of these artisans! Just after the 7K mark, look out for the cylindrical watch-tower (Chaubara) at the crossroads. This is a majestic clock-tower so do stop and take pictures along the way! Turn around at the the Chaubara and as you head back to the Fort, you will spot the Madrasa of Mahmud Gawan – a 500 year old ancient university, and now a mosque to your left. Once you cross the finish line at the fort, don’t forget to collect your Bidri-crafted finisher medal! You will have earned it! 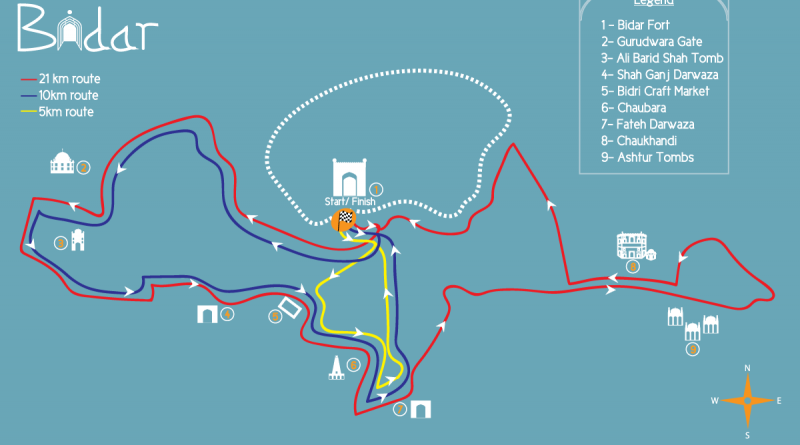 The 21K route starts out at the Bidar Fort, a 500 year old fort constructed by the Bahmani dynasty. If it looks familiar in the light of the early dawn, that’s probably because you’ve seen it in recent Bollywood and South Indian movies. Read more about movies set at the Fort here. As you head in a north-westerly direction, along the fort wall, you’ll spot a very unique feature of the fort. It is one of the few in the country to have a triple-channelled moat. It might be dry and in a state of disrepair today but is still quite a sight to behold. As you head northward, and toward the 4K mark, you’ll spot the Bidar’s famous Gurudwara- the Gurudwara Sri Nanak Jhira Sahib. Read all about it here. You’ll then head westward at the Gurudwara Gate and run past the 16th century Ali Barid Tomb. From here, you will head eastward and toward the Shah Ghanj Darwaza. As you head further eastward and approach the 9K mark, you will pass the craft market famous for its Bidriware artisans. It will be closed at this early hour but fear not – your finisher medal has been made by one of these artisans! Around the 9K mark, look out for the cylindrical watch-tower (Chaubara) at the crossroads. This is a majestic clock-tower so do stop and take pictures along the way! Turn around at the the Chaubara and as you head back to Bidar Fort and you will spot the Madrasa of Mahmud Gawan – a 500 year old ancient university, and now a mosque to your left. Head past the fort entrance, and you will run along the North-Eastern fort boundary wall, until you hit a Ring Road. After a few kilometers, look out for the Ashtur Tombs – resting places of various rulers of the Bahmani Dynasty. You will also see Chaukhandi, an octagon-shaped tomb built in the honor of the spiritual adviser of a Mughal emperor. After you cross Chaukhandi, retrace your path and head back toward the Bidar Fort. 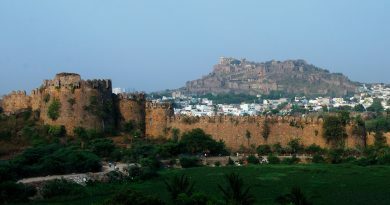 The final kilometer is fairly steep but will give you the chance to appreciate the full majesty of the outer fort wall. Once you cross the finish line at the fort, don’t forget to collect your Bidri-crafted finisher medal! You will most certainly have earned it!